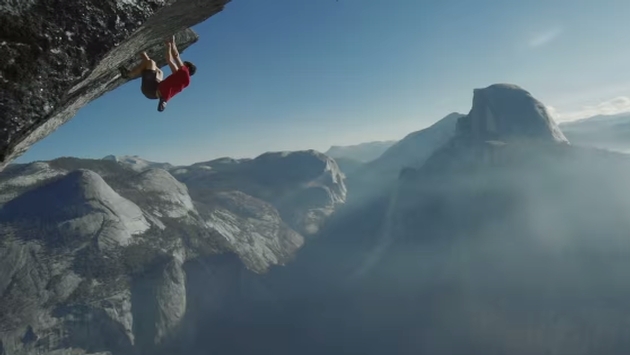 Alex Honnold is like anyone else enjoying the sights of Yosemite National Park in California. What sets him apart is the manner that he gets to certain areas, free climbing without the aid or safety of a rope to heights that will make your stomach queasy. How are the hands doing? The climber might be familiar to anyone who has ever scoured the Internet for ridiculously impressive videos. Honnold and his climbs seem to pop up every so often, because he is that good and his ascents are that moving. You try unsuccessfully to appreciate all the beauty of the surrounding area but you just can’t stop thinking about this human Spider-Man and the obvious dangers that lurk as he hangs nonchalantly from a tiny crevice. What’s not boring or the least bit tedious are the climbs that invigorate. Over 70,000 people have seen each of the YouTube videos for a reason: We simply can’t take our eyes off a man who, while human, doesn’t share a common human fear, and that makes him and his endeavors remarkable.